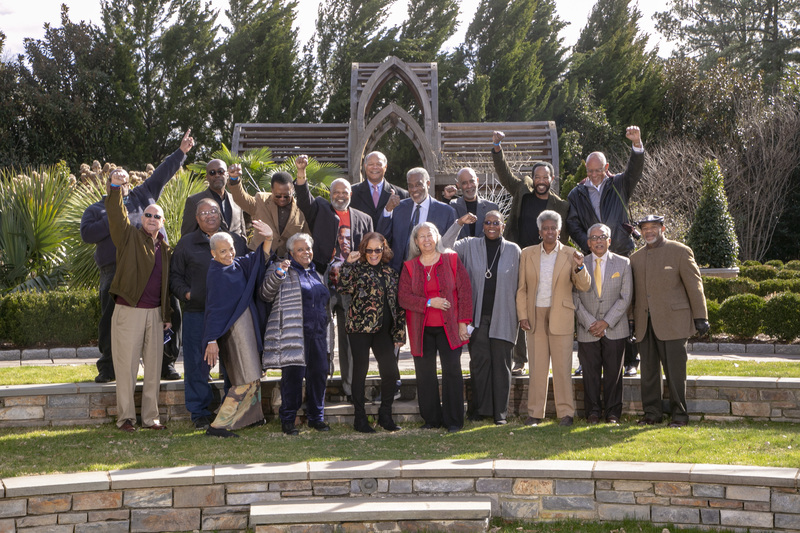 Members of the original group of black student activists who participated in the 1969 “takeover” of the Allen Building gather for a group portrait at Duke Gardens. (Not all pictured.) Credit: Duke University Communications. The 1969 Allen Building Takeover has loomed large in Duke’s history. 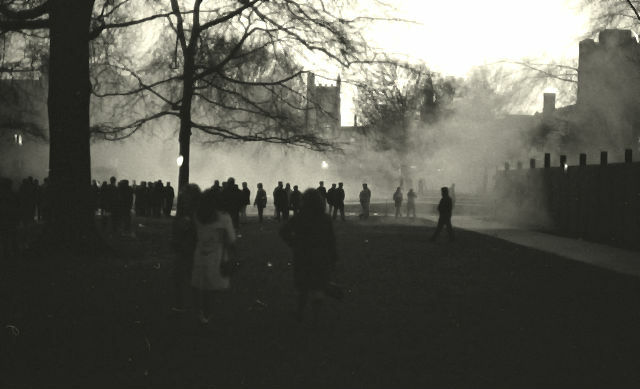 This past weekend, Feb. 9-10, nearly two dozen of the Duke alums who protested returned to campus to check on the status of the demands they issued 50 years ago and to see the impact of their activism. 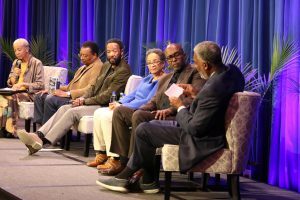 The sold-out event, “Commemorating the Allen Building Takeover: Fifty Years Later,” was hosted by the Department of African & African American Studies (AAAS) and held in the Ambassador Ballroom at the Washington Duke Inn. Two panel discussions, “The Original Protesters Tell Their Stories,” and “Activism Then and Now: An Intergenerational Discussion,” were followed by a reception at the Nasher Museum of Art. Hundreds attended and watched via livestream. On Saturday morning, the black Duke alumni who participated in the Allen Building Takeover were invited to a private brunch with President Vincent Price. Price acknowledged their role in challenging Duke to become more inclusive and diverse. “In the action that you took, you forever shifted our sails towards the prevailing winds of justice and equality,” Price said. 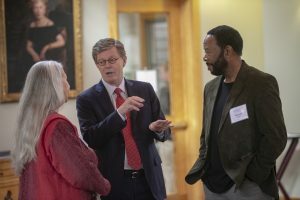 Lynette Allston, ’72, and Mike LeBlanc, ’71, speak with President Price during a private Saturday morning brunch for the original Allen Building protesters. “I don’t quite know how to say thank you enough for what you did 50 years ago,” Valerie Ashby, dean of Trinity College of Arts & Sciences, told the alum in her introductory remarks during Saturday’s main program, adding that her role on campus would not exist had it not been for the takeover. Ashby joined Mark Anthony Neal, chair of AAAS, and Qsanet Tekie, ’19, president of the Duke Eritrean and Ethiopian Student Transnational Association, to welcome “the Originals” and provide historical context for their activism 50 years ago. On Sunday, the Duke alumni had an informal Sunday service with remarks by Rev. Bill Turner, ’71, and previewed an exhibit on the takeover in Perkins Library. Many of “the Originals” had attended rural, segregated schools. They had been hand-picked by their communities — as national merit scholars and academically gifted — to attend Duke not long after the university integrated in 1963. The impetus for the Takeover came when fall semester grades were released. “I had black people coming up to me who had never come to any meetings or who had never spoken to me, come to me and said, ‘Chuck we have to do something, these grades are not fair.’ They had stories of [the racism] they had experienced in class,” said Chuck Hopkins, ’69, co-founder of the Afro-American Society. 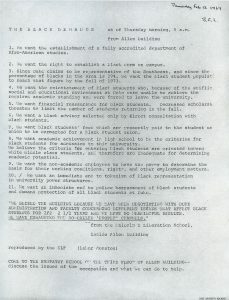 On Feb. 13, 1969, Hopkins and dozens of other black Duke students barricaded themselves inside of the Allen Building, presenting the university administration with a list of demands, an action that has become a model for student activism on campus over the years. The takeover resulted in the hiring of more black faculty, the creation of a black studies program which would eventually become AAAS, and a black student union that is now the Mary Lou Williams Center for Black Culture. All agreed it took courage and commitment to go into the building. “I was concerned we might die, especially if we brought guns,” Michael McBride, ’71, said. At other colleges and universities, students were being shot and killed for protesting. “One of the things we strategized in our meetings was that we weren’t going to bring arms or touch anyone. Our whole thing was let’s not give the administration a reason to focus on something else,” Hopkins said. During the first panel, The Original Protesters Tell Their Stories, Charles Becton, JD ’69, reads a statement from President Price. Fuller, who at the time of the takeover was a local community activist in Durham, mentored the Duke students and later became co-founder of Malcolm X Liberation University, where some of them enrolled after leaving Duke that spring. In the aftermath, the students were put on probation, some were arrested, and some left Duke altogether, never to return. The Department of African and African American Studies (AAAS) at Duke University will kick off the 2018 academic year with a town hall forum on reparations. The event, “Reparations Now? 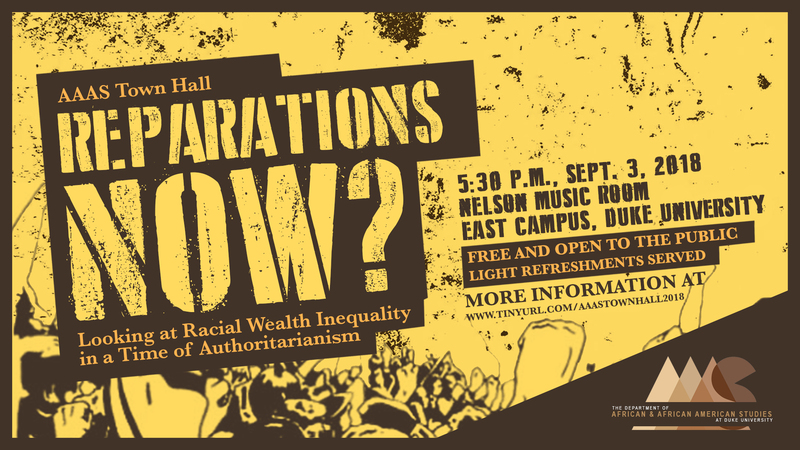 Looking at Racial Wealth Inequality in a Time of Authoritarianism,” will be held at 5:30 p.m. on Monday, Sept. 3rd, in the Nelson Music Room, East Duke 201, on the university’s East Campus. It is free and open to the public. Light refreshments will be served. 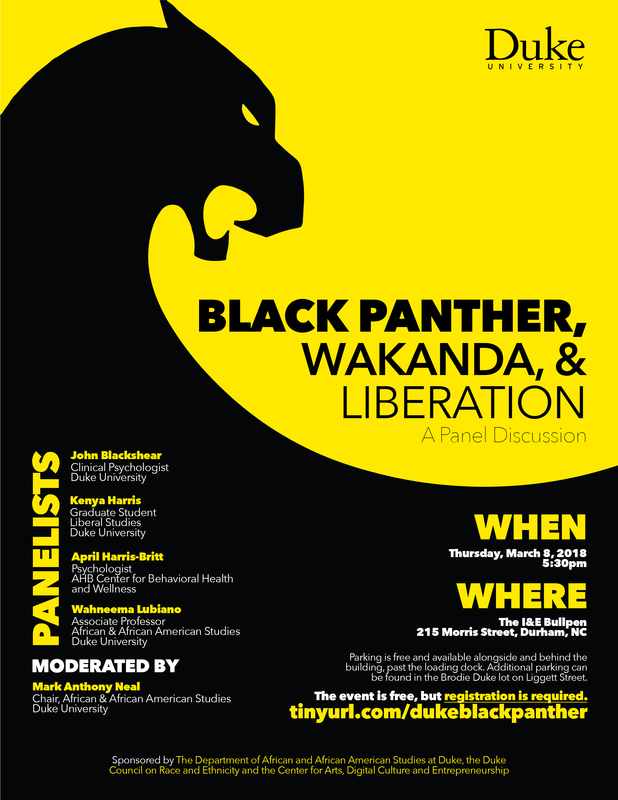 Panelists will address the question: What might come of public dialogue around the question of reparations for African Americans in the era of the Trump regime with its continual attacks on the press and dissemination of knowledge, and while there is a Republican-controlled Congress? “We are living through a moment when two converging elements of our social, political, and economic existence are coming together: the existence of heavily racialized wealth inequality and increasing authoritarianism,” says Wahneema Lubiano, a professor of African and African American Studies. Lubiano is co-organizing the event with William “Sandy” Darity, the Samuel DuBois Cook Professor of Public Policy, and a professor in the Sanford School of Public Policy, Department of Economics as well as the Department of African and African American Studies. 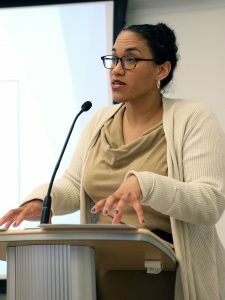 “We’re going to discuss what reparations has meant and could mean, what concepts are embedded in the public discussion of wealth inequality, and what the relation of reparations might be to changing racialized wealth inequality, all while authoritarianism is both gathering force and contested,” she said. More than 50 people gathered in the Ahmadieh Family Conference Room on Tuesday evening, April 24, for a special meeting of Duke’s Introduction to African & African American Studies class, taught this spring by department chair Mark Anthony Neal. 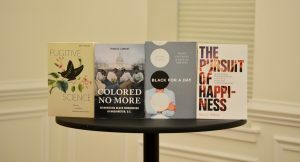 Professors Britt Rusert, Treva Lindsey, Alisha Gaines and Bianca Williams are Duke Ph.D.’s who each had a book on blackness published in the past year. Neal made those books assigned reading for the spring class and invited the alumnae back to campus to speak with students and to revisit their formative years where the seeds for their intellectual pursuits were planted. 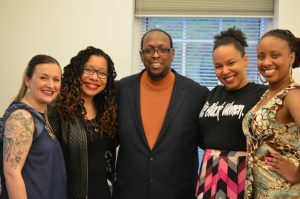 Professor Mark Anthony Neal with (from left to right)) Britt Rusert, Alisha Gaines, Bianca Williams, and Treva Lindsey. Photo Credit Suzanna Larkin. 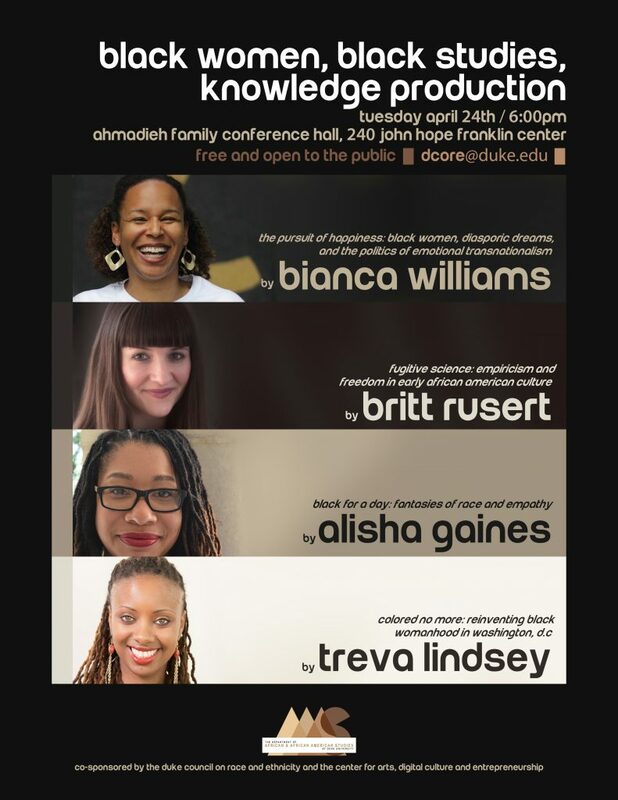 The symposium, “Black Women, Black Studies, Knowledge Production,” was entirely curated by graduate and undergraduate students in a demonstration of vertical learning. English Ph.D. student and teaching assistant Israel Durham designed the program for the 2.5 hour symposium, allowing each student an opportunity to converse with the authors. 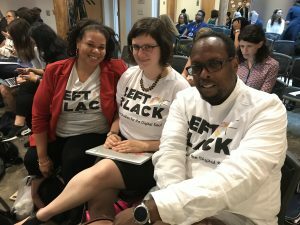 Wearing a “#CiteBlackWomen” t-shirt, Williams told students that what they were experiencing was special and a testament to the “brilliant teaching” at Duke. “You get to co-create. You also know things. You have useful questions. You know enough to engage scholars,” she told students. “I just want you to know this isn’t normal. This doesn’t usually happen,” Williams said, noting the generosity of professors like Neal and Wahneema Lubiano, an associate professor and mentor to the women, who also attended and joined the women for the last panel of the evening. Lindsey agreed, reminiscing about the familial kinship she felt in her cohort and with the faculty. Gaines, who is interested in black popular culture and reality television, said Black women gave her a way to imagine herself as a scholar and a thinker, especially as an undergraduate student at Spelman. “I’m a good teacher because I have had good models for it,” Gaines said. Rusert remembers the freedom to be intellectually adventurous while she was a student at Duke. “I was 22 years old and remember being in that class (The Post-Black Aesthetic). MAN took our ideas seriously. I remember being like ‘wow!’ This professor really wants to hear what I think,” she said, adding that the interdisciplinarity of the department prepared her for study in her field in unexpected ways. Also, she said that she’s been able to confront Southern bias as a professor now teaching in New England. “I am really grateful to have had time training in the South because I can correct some misunderstandings,” Rusert said. Rusert is an assistant professor in the W. E. B. Du Bois Department of Afro-American Studies at University of Massachusetts, Amherst, is the author of Fugitive Science: Empiricism and Freedom in Early African American Culture and co-editor of W. E. B. Du Bois’s Data Portraits: Visualizing Black America, a collection of data visualizations Du Bois contributed to the 1900 Paris Exposition and forthcoming from Princeton Architectural Press in fall 2018. She earned an English Ph.D. and certificate in feminist studies from Duke in 2009. She is beginning a new monograph about William J. Wilson’s African-American Picture Gallery (1859), a text that imagines the first museum of black art in the United States. Lindsey is an associate professor and the Director of Undergraduate Studies of Women’s, Gender, and Sexuality Studies at The Ohio State University. She authored, Colored No More: Reinventing Black Womanhood in Washington D.C., a Choice 2017 “Outstanding Academic Title.” Recently dubbed #ProfessorBae by Bossip magazine, Lindsey’s research and teaching interests include African American women’s history, black popular and expressive culture, black feminism(s), hip hop studies, critical race and gender theory, and sexual politics. She earned a master’s degree and a Ph.D. in history at Duke. A lifelong Michael Jackson fan, Alisha Gaines received a Ph.D. in English from Duke and also received the graduate certificate in African and African American Studies. She is assistant professor of English at Florida State University where she won a university-wide Undergraduate Teaching Award in 2017. Her first book, Black for a Day: Fantasies of Race and Empathy, was published in Spring 2017. Inspired by the short-lived F/X reality tv show “Black.White,” the book constructs a genealogy of white liberals who temporarily “become” black under the alibi of racial empathy. As such, Gaines has a love/hate relationship with Rachel Dolezal. 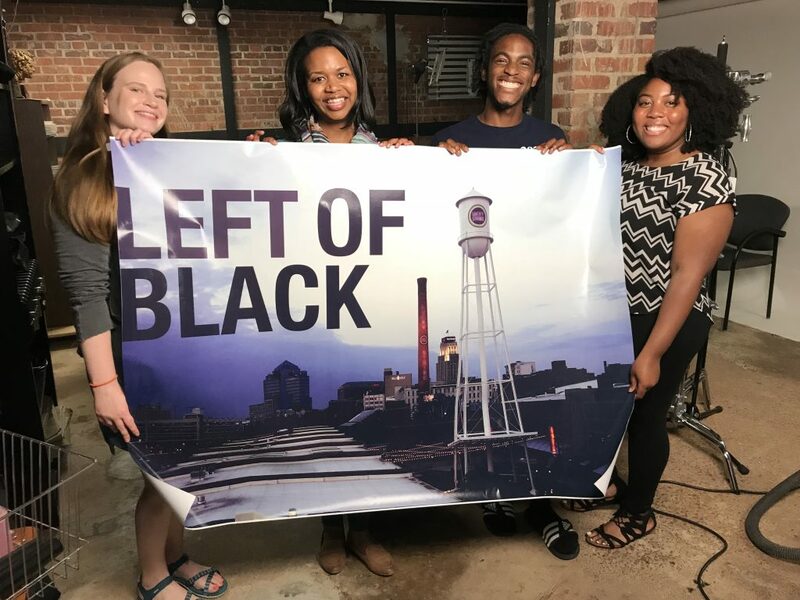 The four authors taped upcoming episodes of Left of Black. 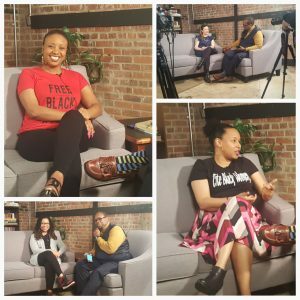 An associate professor of anthropology at The Graduate Center, City University of New York, Bianca Williams is also Black Lives Matter organizer, co-founding the Denver chapter. She earned a bachelor’s degree and a Ph.D. in cultural anthropology at Duke, and a graduate certificate in African and African American Studies. Her book, The Pursuit of Happiness: Black Women, Diasporic Dreams, and the Politics of Emotional Transnationalism, how African-American women use international travel and the Internet as tools for pursuing happiness and leisure; creating diasporic relationships; and critiquing American racism and sexism. Central to her research is the question, how do Black women develop strategies for enduring and resisting the effects of racism and sexism, while attempting to maintain emotional wellness? Neal, host of weekly webcast Left of Black, interviewed the four women about their work earlier that day in the John Hope Franklin Center studio for upcoming episodes of the show. An appearance on Left of Black has increasingly become a rite of passage for a network of young black studies scholars. “A cohort experience becomes part of our building of knowledge so the production part is apparent. We’re making it as craft, it’s not an arcane thing,” Lubiano, an associate professor of literature and a long-time Duke faculty member, told students at the symposium. “We are actively participating in creating knowledge, thinking about the students and making them central to the work early on. 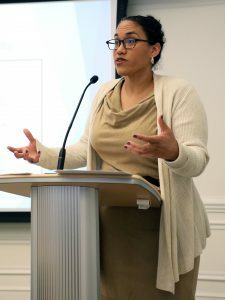 On Wednesday, Vanessa K. Valdés of The City College of New York, presented her research on Arturo Alfonso Schomburg, whose personal collection became the foundation for the Harlem-based and world-renowned Schomburg Center for Research in Black Culture. Valdés is the author of “Diasporic Blackness: The Life and Times of Arturo Alfonso Schomburg,” only the second full-length biography. During her talk, “Building an International Archive in the Jim Crow South: Arturo Schomberg at Fisk University,” Valdés highlighted the collector’s global vision for his collection as well as the importance of access to the material. The lunchtime talk was the latest installment of “Wednesdays at the Center,” held at the John Hope Franklin Center, which features a different speaker each week throughout the semester. 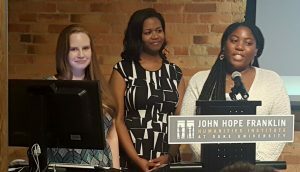 Valdés, a professor of Spanish and Portuguese, said that Schomburg, a Black Puerto Rican, helped establish Fisk University’s Africana collection in Nashville, now named the John Hope and Aurelia Franklin Library. “Most have no idea about the man himself,” said Valdés, who pursued her graduate degree in Nashville. There is only one biography of Schomburg and it was published in 1989, she said. The Carnegie Foundation bought Schomburg’s personal collection for $10k which he used to travel across Europe and further develop his collection. However, he donated much of his work without compensation. In Nashville, Thomas E. Jones was president of Fisk when Schomburg began assembling the library in 1929. He worked alongside his good friend, sociologist Charles S. Johnson, to replicate what he had accomplished in New York, building a black archive in Fisk University’s Cravath Hall, complete with a reading room. “At the time, black people were steered toward vocational schools and not necessarily reading for pleasure,” Valdés said. Under Schomburg, Fisk established a reading room to “inculcate a desire” in students to read for pleasure. “Being an active member of society meant being knowledgeable. He was creating spaces of liberation,” Valdés said. Schomburg spoke through his collection, highlighting moments of black independence and responding to U.S. hegemony in the Caribbean. The Fisk collection concentrated on presence of people of African descent internationally, taking on a global character, telling the story of blacks in Europe and the Caribbean. There were 140 books when Schomburg arrived and more than 4,000 by the time he left Fisk. His efforts were not replicated at other schools until decades after his death, she said. Johnson, the first black president of Fisk, acknowledged Schomburg’s “generosity and foresight” in curating books for the university’s then-named Race Relations Institute. The event was sponsored by the Center for Arts, Digital Culture and Entrepreneurship at Duke. A Conversation on the State of Voting Rights in N.C.
DURHAM, N.C. – On the eve of a federal briefing on voting rights in Raleigh on Friday, a panel of experts will gather at Duke Thursday night to discuss the state of voting rights in North Carolina. The U.S. Commission on Civil Rights, an independent federal watchdog agency, will hold a public hearing in Raleigh, which will include testimonies about N.C. voter experiences at the polls. Ahead of the hearing, The Duke Council on Race and Ethnicity (DCORE) and The Raben Group are co-convening a Thursday, Feb. 1, panel discussion and public forum to bring attention and awareness to voting rights issues. 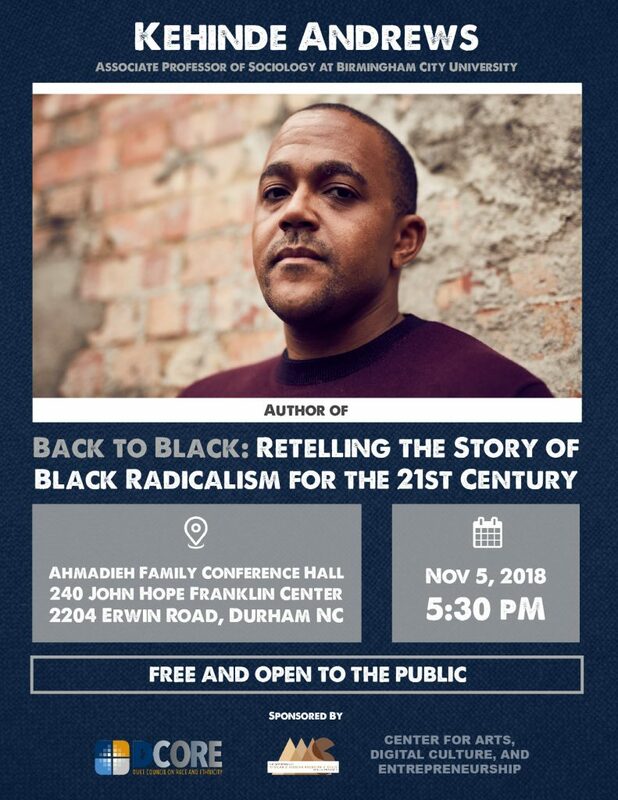 The free event will be held at 5:30 p.m. in the Ahmadieh Family Lecture Hall at Smith Warehouse, Bay 4, C105 (114 S. Buchanan Boulevard, Durham). Free parking is available. Those unable to attend can watch a live stream here: https://www.youtube.com/watch?v=pgQ9mgFZYME. The forum is intended to allow scholars and community leaders to examine the state of voting rights in North Carolina and to provide cultural and historical context for the hearing. The event will be moderated by Mark Anthony Neal, chair of the Department of African and African American Studies at Duke, which is co-sponsoring the forum. The following day, Feb. 2, the U.S. Commission on Civil Rights will hold a day-long public meeting in Raleigh to gather public testimony about voting rights obstacles in for its 2018 report to Congress. The Commission plans to address voting rights enforcement efforts after the 2006 reauthorization of the temporary provisions of the Voting Rights Act of 1965 and the impact of the Shelby County v. Holder Supreme Court decision. 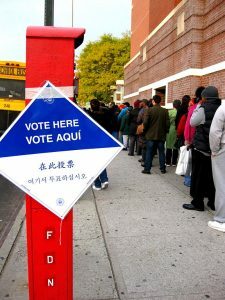 The Commission will also consider enforcement of Sections 2 and 203 of the Voting Right Act, and whether new or enhanced federal protections could expand voting opportunities for all Americans, including those historically underrepresented because of their race, color or minority language group membership. For more information on the hearing, visit http://www.usccr.gov/press/2018/01-26-Sunshine-Notice.pdf.